Sega Amusements International looks forward to exhibiting its latest, high earning products at Eag, from 16th to 18th January, at ExCel Exhibition Centre, London. After having had a superb Iaapa show, the company confident 2018 will be a fantastic year. Its product line-up is strong, and the company can’t wait to show its products to UK and international Customers at EAG. Sega’s innovative games will be accompanied by the Parts & Customer Service division Sega Total Solutions (STS) while highly desirable licensed plush & prizes supplier Sega Prize International (SPI) will exhibit their latest products. Hoopla is Sega’s latest Redemption game, that’s getting glowing reviews from customers all over the world. Fun, simple and intuitive, this carnival themed game can be enjoyed by the whole family. A collaborative development by Sega and ICE, Hoopla is the latest addition to the incredibly famous carnival themed skilled wall. 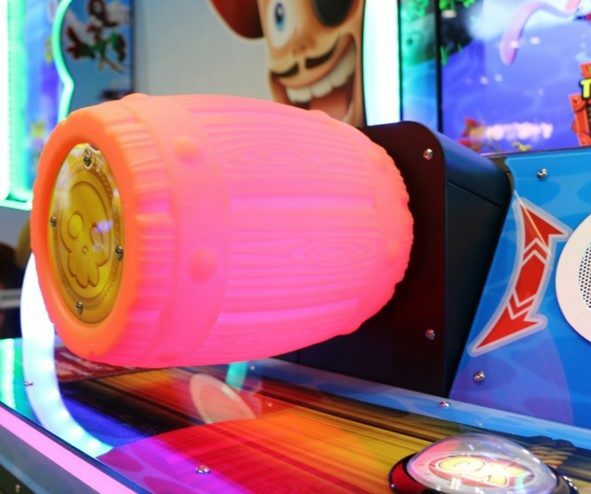 Visitors on Sega’s stand can experience Hoopla and all the other Skill Wall such as Bean Bag Toss, Down The Clown, Ice Ball FX and Milk Jug Toss. Also in the redemption category will be the latest release from ICE, Wheel of Fortune. A simple to understand game based on the classic TV game show Wheel of Fortune – “Its is going to be a huge game, with its incredible presence it just looks ‘wow’! The game play is easy but compelling, encouraging repeat play – its perfect for any arcade or FEC” commented Sega’s Justin Burke. The interactive game show host and voice prompts help keep the player wanting to spin the wheel over and over. Other notable new ticket redemption games to look out are Zombie Snatcher with brand new self-reload functionality, Pirate Falls – video redemption and Maze Escape – mechanical redemption. Basketball games are making a big comeback in 2018, and Sega has just the line-up for operator’s large and small. Officially licenced NBA basketball games NBA Hoops, NBA Game Time and NBA Hoop Troops are all part of the brand-new Sports Wall. The bigger NBA Hoops will make players will feel like a pro, while mid-sized NBA Game Time is ideal for most locations, and NBA Hoop Troops designed just for kids. All these games are packed with great player and operator features. Don’t miss Sega’s tremendously popular Sonic Branded Sonic Basketball with its brand new ‘Reactive LED Lighting’ effects and cheering audio it delivers a more satisfying feeling every time the player scores. The prestigious Brass Ring Award-winning game Daytona will feature with a brand new overhead multi-coloured lighting marquee at EAG. Cutting edge cabinet design, superior game handling, panoramic attract sequence, and instant re-match feature has put this game at the top of operator’s buying. Furthermore, the latest free software upgrade is packed with new software features and refined existing features which is keeping Daytona at the top of the income charts. Sega’s stand 534 is the place to experience high-octane, action-packed games like; Target Bravo: Operation Ghost available in a 55” atmospheric theatre cabinet and now in 55” Upright Cabinet; Let’s Go Island: Dream Edition features an exciting motion seat and fixed controller to blast away enemies. The follow up to the phenomenally successful prize merchandises Key Master is finally here with Magic Arrow. Fun and simple to grasp but hard to master Magic Arrow has a strong ‘one more try’ gameplay appeal which makes it a winner for most locations. Sega Prize International are exhibiting a wide range of items to suit all operator needs, including their new Tokio Wi-Fi speaker featuring Amazon Alexa, True Wireless Freedom Headphones and Tokio Fit Smartwatch with Heart rate monitor. Additionally, new plush items include Nickelodeons hugely popular JoJo Siwa, plus the cherished brand Only Fools and Horses from the BBC. Sega Total Solutions, a fundamental part of Sega’s after sales service and spares will be on hand to answer questions and discuss their offering of high-quality redemption tickets, change machines and coin cups.